With the nip in the air and the plentiful fresh vegetables filling the market stalls, I’m trying out one warming soup after another. Trying to reduce my rice intake, soups like the Pea Mint Basil Soup along with some great bread, serve as a filling lunch on most days. There is so much green stuff out there, the creative juices are going on overdrive. Add to this, my little balcony garden about which I have been writing quite often in my recent posts. 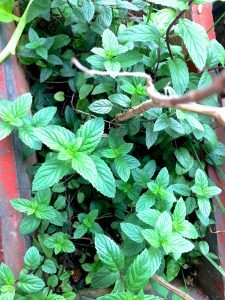 Fragrant peppermint and basil, so green it hurts the eyes. Rosemary. Parsley. Curry leaves. I have to force myself not to add too many herbs in my recipes. The Pea Mint Basil Soup actually started out as a Pea Mint soup, but then what was I to do with all this basil. I made basil oil as well as pesto a few days ago. I’ve been adding the basil leaves to pasta, salads and sandwiches. Im not complaining, I just want to use this bounty in as many tasty ways as possible. 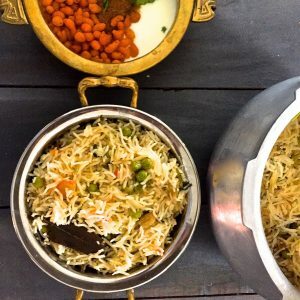 When Renu Agrawal Dongre of Cook With Renu Food Blog offered to take contributions for the Legume Love Affair, I explored options – dals, usilis with lentils, lentil stews etc. The bag of fresh peas I bought during Saturday grocery shopping decided it for me – a happy, warming, nourishing Pea Soup. 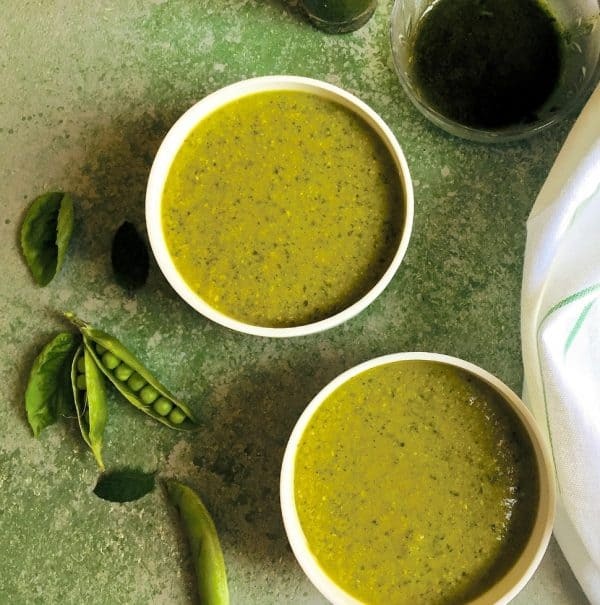 Add some of the herbs from the garden, and there I was with this tasty Pea Mint Basil Soup. 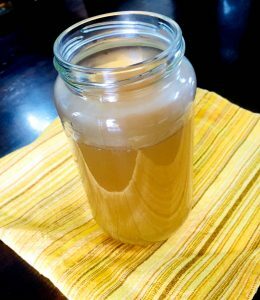 Once the stock is ready, the soup takes little time or effort to prepare. Now I should make more stock and freeze it so that whisking up some soup becomes that much easier. All the best, Renu, I hope the event is a grand success and we see many interesting recipes being added on this theme. One specific about this recipe: You may use fresh or frozen peas, whatever is available to you. 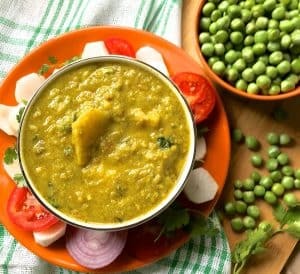 If making the soup with fresh peas, remember to add a little frozen peas at the final puree stage. This helps give back some of the green colour which cooking takes away from the soup. And another thing, I don’t let the peas simmer for too long, just 5 minutes or so in really hot water/ stock, so that they become tender but don’t lose all that fresh peas taste. 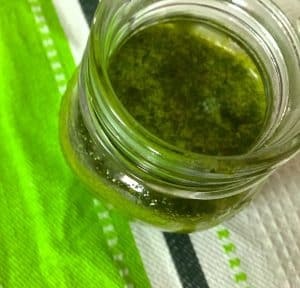 Here’s the link to my recipe for Homemade Basil Oil. I have garnished the Pea Mint Basil Soup with Basil Oil. Chilli oil would also be a good option for garnish. Prepare stock. (Time for preparing stock is not included in the above Cook time and prep time). Set aside till required Mince shallots, basil, mint leaves. Reserve 1 teaspoon each for garnish. Peel the garlic and crush lightly, keeping it whole. While the shallots are getting done, heat the required volume of stock and bring it to a boil. Add fresh peas, stir and add the boiling hot stock Bring the peas and stock again to a boil, then reduce the heat to low and let it simmer for about 5 minutes. Blend the soup and then add frozen peas and blend again to a silky smooth puree or if you prefer, keep it a little coarse ( I prefer the texture of the soup coarse) The frozen peas is added to give a better green colour to the soup as boiling would have reduced the colour of the fresh peas. If you have used frozen peas for the soup, then more peas are not required during blending. Check the seasoning and serve the soup hot with a garnish of mint, basil and a drizzle of basil oil, garlic oil or olive oil. Link to the recipe for homemade Basil oil, on this blog, is given in the post write up above. This soup looks so relishing and comforting much needed in the freezing temperatures here!! Love the color of it!! Thank you Swati! More such soups coming up soon! OMG, a soup with green pea, mint and basil, what a different combination and awesome flavours here. Love the beautiful green colour of the soup. I would love to try this, I have a lot of fresh Basil and was looking for ideas apart from adding in pasta’s and I have this one now. Bookmarking it for sure. Thank you for Linking it with MLLA. Thank you, Renu!It was very tasty indeed, with all the fresh flavours!